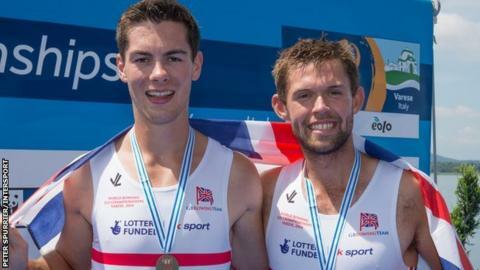 British rower Jack Beaumont remains in hospital a week after he and double sculls team-mate Angus Groom were injured in a training camp accident. Their boat collided head on with the Great Britain men's eight boat at the Aviz Training Centre in Portugal. Beaumont, 22, suffered back trauma but is expected to make a full recovery. Groom is already back in training and is a sculling reserve for the World Championships starting in Aiguebelette, France on 30 August. Beaumont rowed at last month's World Under-23 Championships where he was fifth in the men's single scull final. Earlier this season he won a bronze medal in the quadruple scull at the European Championships at senior level as a substitute for Charles Cousins. He had not been selected to travel to France.